What will I do with my pain? 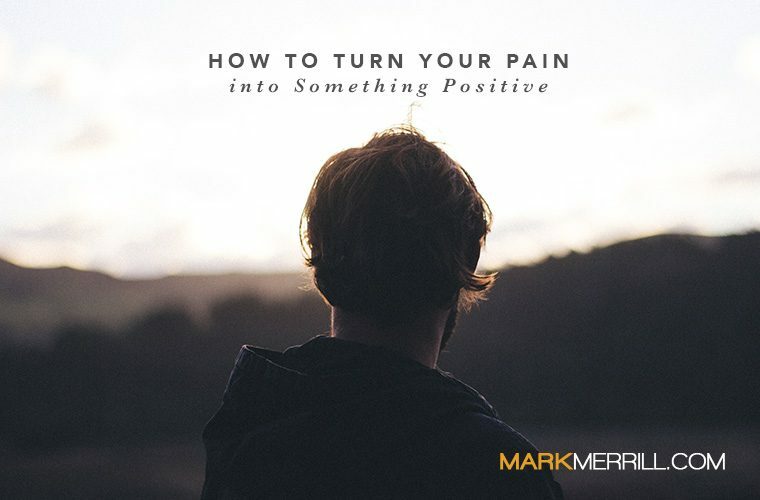 How can I turn my pain into something positive? Whether pain is physical or emotional, it can be used for good, to make a positive impact on others. Pain can bring clarity to what is most important in life. Yes, pain can create an emotional fog and make it hard to think straight. But it can also force you to an off-ramp in life for a while that can help you take stock of your priorities. As I’ve been working through the pain and fog, I’m also finding some clarity on things that are important in my life. It’s been a good time to take stock of my usage of time and resources to ensure I’m being a good steward of what’s been entrusted to me and my family. Pain can be a bonding agent in relationships. Pain allows you to identify with another person who is going through something very similar. Empathy is an important character trait of a loving leader. When you empathize with others, you experience similar feelings, thoughts, and emotions and then take action based on what you’ve experienced to meet the needs of others. It’s often the things we have in common that create or deepen our bonds. Pain can change your trajectory. Past pain can motivate us to look outward instead of just inward. [Tweet This] Sometimes pain is paralyzing, and we get very self-focused as we deal with it. But as we do, pain (especially relational pain) can eventually help us to see the need to work towards helping others. Maybe it’s breaking a cycle of dysfunction or brokenness in a family tree that we’ve experienced, or picking up the pieces from an addiction we’ve battled that has hurt more than just ourselves. Eventually, we face a choice: stay focused on self or be motivated to help others. Pain can give us credibility and opportunity to help others. When we have endured pain we’ve never experienced before, we have the power of empathizing with others going through the same pain, not just those suffering in general. As a result, others are aware that we know what they are going through and will listen to what we have to say, perhaps even more so than others who try to speak into their lives but haven’t shared the same pain. Pain can give us a future message of hope to others. As we deal with the pains of our past or present, God gives us hope and healing that can become a very meaningful message to others. The pain can become a purpose for our voice as well as the message of hope our voice proclaims to the world. What are some other ways you’ve turned pain into something helpful and positive in your life or the lives of others? Share here.